Napoleon Holborn of Komga is the 2018 Agricultural Research Council’s Emerging Beef Farmer for the Eastern Cape. Mike Burgess visited him to learn about his beef operation and how he has built it, and his other business interests, on the solid foundation laid by his father. ‘When I’m here I have peace of mind,’ says Napoleon Holborn of working with his cattle. 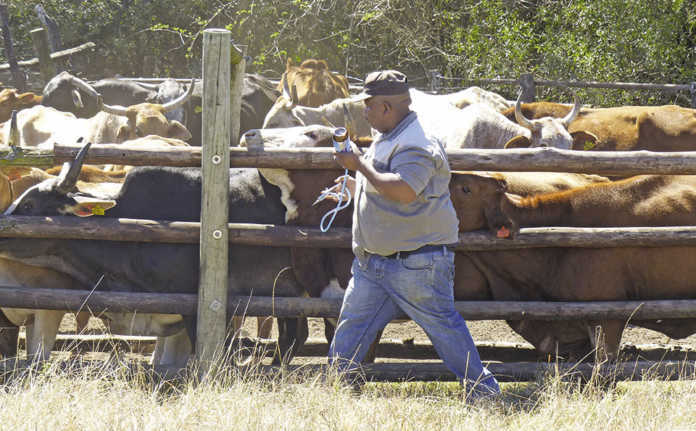 Napoleon Holborn’s beef operation on the 750ha farm, Mellow, forms part of his broader business interests in the Eastern Cape. These include a tavern, a spaza shop, two bottle stores (currently leased out) and a small civil engineering company. Profits from these have enabled him to subsidise the farm in times of increasingly serious drought. It would be wrong, however, to think of Holborn’s beef operation as merely another of his enterprises; this is where his real passion lies. And his recently awarded title of 2018 Agricultural Research Council Emerging Beef Farmer for the Eastern Cape is testimony to this. 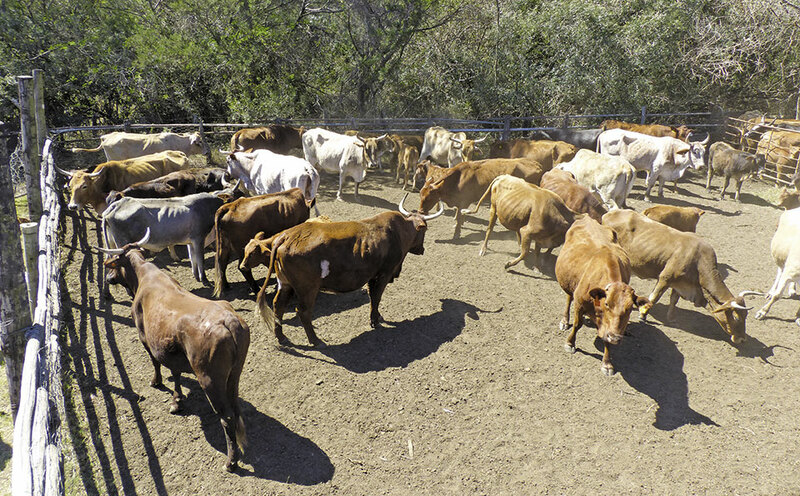 Holborn farms what he considers the best-suited beef animal for the mixed veld of the area: the composite Simbra. In doing so, he is building upon the foundation established by his father, Owen. By 1994, Owen had established a herd of between 30 and 40 Brahman-type cattle on the Kei Mouth commonage about 60km from Komga. He had also opened two bottle stores and a spaza shop in Kei Mouth. By the time he was 12, Holborn was helping with the daily running of the businesses. He recalls spending many hours offloading stock from delivery trucks and looking for the family’s cattle before school. In 2003, Owen bought a 600ha farm between Kei Mouth and Komga, and this was followed in 2005 by a 342ha farm along the N2 between East London and Butterworth. These were sold in 2009 and 2016 respectively. The farms freed the Holborns from the grazing restrictions of the commonage, and they could now increase cattle numbers. They did so by purchasing genetics from a number of local farmers, including well-known Brahman breeder Miles Dicke. Owen then applied for a land reform farm and was awarded Mellow in 2010 as part of the Land Redistribution for Agricultural Development programme. At this stage, Holborn, who had matriculated in 2008, had not only completed a number of IT courses, but launched several businesses, including a small civil engineering company and a tavern in the Kei Mouth township. In 2012, tragedy struck when Owen died suddenly, and Holborn was left to run the family businesses alone. Two years later, fortuitously, he was awarded a R1 million grant for Mellow through the state’s Recapitalisation and Development Programme. He used this to refurbish the home and outbuildings, clear bush, repair the livestock handling facilities, replace old fences, and sink a borehole. He is convinced that the Simbra-type is the most productive beef animal for the virulent redwater, heartwater and gallsickness veld of Mellow. Brahman crossbred cows on Mellow near Komga in the Eastern Cape. Holborn’s current focus is to breed Simbra-type cattle. Although Holborn still has a variety of Brahman crosses on the farm, he uses only Simmentaler and Simbra bulls today. To speed up the genetic transition to a Simbra-type, he is considering the use of artificial insemination. Cows are put to bulls from November to January in single-sire herds of 25 cows. “I don’t want any mistakes,” says Holborn. His 120 breeding females achieve a calving rate of more than 80% and calves are weaned at eight months. Weaner weights average between 250kg and 320kg. About 15 Simbra-type replacement heifers are retained each year. “The heifers undergo severe selection,’’ explains Holborn. The cattle receive a protein block in winter and a phosphate/salt lick in summer. In recent years they have also received a chicken litter/salt/molasses ration. The same ration is used to prepare cows before going to the bull. “The chicken litter is excellent. It keeps my cattle going,” says Holborn. It is sourced from Wade Bailey, who is contracted to clear broiler sheds in the Stutterheim/East London areas. Holborn is also preparing 3ha for the establishment of ryegrass to support cows with calves. The cattle are dipped with a pour-on dip twice a month in summer and once a month in winter to manage tick loads. They also receive an injectable solution once every three months. A standard inoculation and dosing programme is strictly adhered to. Although the theft of 32 cattle in 2015 reflects the significant threat that crime poses to his cattle, Holborn says the most worrying challenge has been the relentless drought. It underscores the importance of an alternative income to cushion Mellow’s feed costs. “You can’t focus on just one thing,” says Holborn. Although his main focus is on producing weaners for the feedlot market, Holborn has diversified by speculating with oxen. He buys oxen at between three and four years from communal areas between Kei Mouth and Komga, fattens them for three months on a chicken litter-based ration, and sells them. This sideline adds to Mellow’s cash flow. Phone Napoleon Holborn on 073 122 9938.